The major educational associations have gone so far as to refrain from using the term foreign languages, opting instead for “world languages.” I’m sensitive to political debates about nationalism, but I do not believe it has a place in educational discourse. When people get bogged down by these trivial discussions, we miss out on the many powerful benefits of learning other languages. Joy in learning another language? I can relate to your confusion because I had one of those teachers in ninth grade for Spanish 1. There were lots of vocabulary lists, endless and pointless verb conjunctions, and difficult dialogue about Pedro in España. I don’t know about you, but I don’t know anyone named Pedro who lives in Spain! But, for Spanish 2, 3 and 4, I had Señora Thiems. She introduced us to current music and food, showed us slideshows of her trips to Hispanic countries, held fiestas at her house, and she had abundant joy in her attitude toward learning the language and life in general. That is precisely the mindset I have brought to my teaching. Students who do not continue using Spanish for career, travel or relationships will soon forget most of the grammatical structures and stem-changing verbs that we spend mucho tiempo learning. These former students found joy in learning. Now, those silly songs will stick with them for the rest of their lives. What a privilege to have been a part of that joy for the past 35 years. I could tell you numerous stories about the power of other languages. Parents with an autistic child who never thought their child could learn another language. Latina families trying to keep their heritage but struggling to find the time and method. Reluctant moms and dads who learned or relearned another language they never thought they could or would. These are just three of the important reasons to learn another language. It’s not just to fill an elective in the school schedule. Ask the Lord for the right attitude and the right program to unlock the potential in your children (and yourself). This will help your students experience the joy of learning a “foreign” language. A comprehensive list of foreign language curricula, most of which are reviewed, visit Cathy Duffy Reviews. But wait! Unless you’re trying to avoid computer-based learning, why would you pay for foreign language curriculum? Duolingo and Mango are every bit as good as other pricier programs. Duolingo offers free instruction in 27 languages plus Klingon and High Valyrian. Duolingo uses very similar techniques to Rosetta Stone and it’s tapped into addictive gaming techniques that make you want to continue to study—even when you really don’t want to! Duolingo is a great program, used by many experienced language learners, and you can’t beat the value of a free program. Mango is another reason not to pay for foreign language curricula. Available for free through many local libraries with your library card, Mango offers quality, free instruction in 71 languages. There are also lessons on culture and a selection of movies for learning language through film. Global Works offer 14-21 day experiences for Spanish and French immersion. Or create your own immersion experience by arranging a homestay in another country. Not only are homestays a great way to learn language in the highly effective “survival mode,” but you get great exposure to the culture and the way an average family lives. Many families involve their guests in their activities or take pleasure in sharing their hobbies and talents with their guests. My family did a home-stay in La Paz, Bolivia, and our hosts used to be professional athletes. We got to join them for a national soccer game and they took us to their athletic club where we played wallyball. No vocabulary needed and so much fun! A homestay in a developing country can be as inexpensive as a week in Orlando, so don’t rule it out as a vacation option. Even after a stay as short as 10 days, your budding language abilities will take a giant leap forward. For parents to want to start during the preschool years, prime time for easy language acquisition, there are many curricula and didactic materials targeted to this age group, such as TalkBox.Mom, an at-home immersion experience with materials in 18 languages. ALHI is an American-based program that exclusively seeks out Christian families with which to place international guests. iTalki.com is an online platform with more than 3 million users where you can find experienced language professionals to just chat with (via Skype). It is ideal for students who are doing well enough with a written curriculum but lack practice in conversation, or you can use it as your total language instruction solution. Starting at $4 an hour, spending a couple of hours a week could be almost as affordable as purchasing a curriculum like Rosetta Stone. Perhaps you could even find a teacher who is willing to work with a small co-op group, and then this option becomes downright affordable. Between immersion on the one end of the spectrum and book-based learning on the other, there are many ways to teach foreign languages, such as specialized summer camps offered by community colleges, task-based learning and grammar-translation method. The method you select will depend on your comfort level and abilities, yours and your student’s goals, the age of your student and their learning orientation (visual, experiential, auditory…). Perhaps more than any other subject, for learning foreign languages, there’s a big, wide world of possibilities. Most four-year colleges and universities want to see two years of foreign language on the high school transcript. Even if you get past #1, many four-year degrees require two years of foreign language, the previous exposure to which will make these classes much easier! If you excelled at learning languages in high school, you can test out of the foreign language requirement, or be up to 12 credits closer to a major or minor in French, German or Spanish. 90-minutes and $80 later, you’ve got up to 12 college credits if you can score high enough on these CLEP tests. College Board SAT Subject Tests in Spanish, Chinese, French, German, Hebrew, Italian, Japanese, Korean, and Latin can get you past the 101 level and into advanced colleges courses as a freshman. Additionally, College Board offers AP tests in seven languages each May. AP credit not only shortcuts some college, but it increases the high school GPA by one point for that class. Read the provisions for homeschooling families to take AP tests. Fluency in a second language, particularly of larger immigrant communities like Spanish, Marshallese and Vietnamese, can be a valuable skill on a resume for jobs working with the public such as law enforcement, retail sales, social work and healthcare jobs. Knowing a foreign language opens up a world of opportunity. This is no cliche. How likely are you to travel to a country where you don’t know the language over one where you feel confident you can communicate? Spanish is spoken in 20 countries and French in 29. Add that to the 50 countries where English is an official or primary language, and you have access to 99 countries! That’s currently more than half of the world’s countries! Learning a second language can make learning even more languages easier. Take the case of Latin, for example; as the root language for Italian, Portuguese, French and Spanish, a good command of Latin has the learner well on her way to adding another related language. Finally, learning a foreign language can actually improve your thinking. One year of language study raised students’ SAT scores 38 points on average. One study found that foreign language learners have 20% better attention span. And continued interest in foreign languages can help young brains stay young longer, staving off dementia and Alzheimer’s in old age. As Geoffrey Willans said, “You can never understand one language until you understand at least two.” Part of learning a second language is learning the mechanics: grammar, tenses and structures, all of which are in the English language, too. Seeing these mechanics at work in a foreign language often brings clarity on how they operate in our native tongue. In the same way, language study in natural, practical situations, like travel to foreign countries or even frequent visits to ethnic neighborhoods or restaurants, can provide opportunities for breakthroughs. Basic understanding of foreign language grammatical concepts eventually gives way to natural conversations—opening a new world of possibilities. Let’s say you’re in Italy and you walk into a coffee shop for a cup of coffee and to ask for directions. If you ask about paying for coffee when it’s delivered to you, you would likely try to put together the words from a pocket dictionary, “I + pay,” to form “io pagare?” without even trying to sort out the grammar. The server might reply, “Dopo, dopo,” while making calming body motions. Most Italians use a lot of body language and gestures that reinforce their spoken words. You and your students would pick up that “dopo” means “later.” Or, the server might say, “Si, adesso,” and with body language make it clear he would like to be paid now. Next, you ask for directions but don’t quite understand his reply. So when you head hesitantly out the door, the store owner might say, “Aspette, aspette,” which you understand by his hand gestures to mean you should wait. The owner likely wants to walk out the door with you and show you the directions on the street. If you were to consult a textbook to determine what learning just took place, the answer would be problem-solving using visual, social and contextual clues. Ben fatto! The English language has Latin, Germanic and Greek influences, making it easy to learn many foreign words. There are also similarities in grammatical structure with other languages. To begin identifying the similarities, get an introductory language CD. While driving in the car, start with a few basic words that can be easily picked up. Then, watch your students progress to patterning, problem solving and communication skills. An easy example of recurring patterns in other languages can be found by introducing yourself. This is usually one of the first things a native and foreigner do in conversation. Through this exercise, students will build flexible thinking as they put together the combination of potential words, then compare and contrast the words in different languages. Did you notice the similarities in the look and sound of “named,” both llamo and chiamo? When your students learn a new language, they must learn vocabulary and the structure of the language. That includes the order of words, how verbs are conjugated and how nouns are pluralized. Once your students grasp the structure, they will develop the skill of using known words to guess the meaning of unknown words. Remember our math example? It’s a process similar to finding the unknown number “X” in algebra. You’ll soon watch your students improve their speed in this game as you travel and learn. And, the neural connections and skills they develop will last much longer than the trip and will carry over into other skills at home. The pronouns: je (I singular), tu (you singular), nous (us), vous (you plural). “Est-ce que” in front of something forms a question. When you meet someone in a hotel, the person might ask: “Est-ce que vous aller au restaurant ce soir?” It looks complicated written out, but your students’ flexible brains will process this in a snap. The more they practice, the faster they will pick up more words. It’s incredible what a few weeks of trying to communicate in a foreign language will do for your students’ skills. Here are the steps their brain might go through to decode this phrase. One of the words—restaurant—is the same as the English word. That’s handy and happens a lot..
Chop up the code and decode the pieces you know. Okay, we know it’s a question because it starts with “est-ce que.” And, they’re talking about all of us and the restaurant. Your students already know three of the five pieces! Because we know the sentences in French follow the same structure as English, we can guess without much thought that Unknown1 is a verb. What would we do? We’d go to the restaurant. Okay! That must mean “aller” means “go” and “au” means “to the.” That can be confusing, which is perfect for further learning. This “cognitive dissonance,” as educators call it, will send curious kids straight to their language lesson to figure out why “au” is two words here. When your curious students look at their phrase book again, they will find other time phrases such as matin, midi, après-midi and nuit (morning, noon, afternoon and night). This overall process captures the benefits of homeschooling. Students in a traditional French class will waste countless hours learning simple words like “ce” and “au” vs. “a le” that can be difficult to assimilate and remember. However, in our travel-based, problem-solving learning environment, those little words fall into place on their own in real-world practice. The desire to get the words right in the company of others is a fantastic motivator for students. This will drive them to their book to find (and remember!) the right way to use what they learned. If you are not planning an international field trip, your family can still benefit from applying math to language learning. 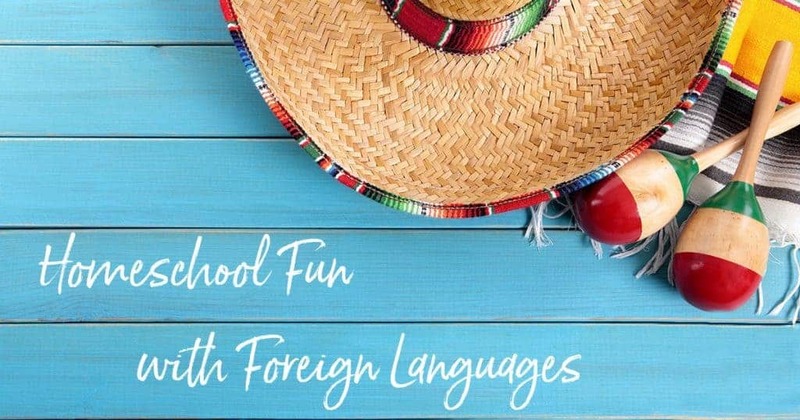 Here are some fun homeschool activities to try with Google Translate. Look up lists of Latin words and compare to their English, French, Italian and Spanish equivalents. Race to see who can be the first to find five very similar words in two to three languages. Explore which subject areas are most likely to have similar words. Help your students make charts of equivalent words in an area of their own interest. If they choose a modern field such as computers, have them identify English words that are used throughout many languages. If they choose an historical period centered on ships, have them look up the etymology (word history) of a few key words or phrases. This could easily lead to an exciting study of various trade routes and empires that caused languages to mix throughout history. Endless adventures at home and abroad await in the exploration of foreign languages. Applying math principles to the learning of languages will help get you well underway. “What started as a guttural, tribal dialect, seemingly isolated in a small island, is now the language of well over a thousand million people around the world.” That’s how a BBC-produced series on the history of the English language begins. Overall, English is a polyglot of Viking, Celt, Saxon, Norman and other influences. The language varies widely from one country to the next, depending on cultural and historic influences. If you’re traveling to another English-speaking nation such as the U.K., Australia or Caribbean, your students should tune their ears to the different words that locals use. Then, have your students conduct research on the Internet or through personal interviews to discover the origins of those words.